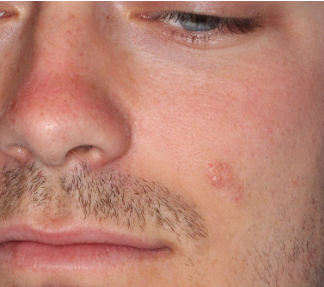 21-year-old male presents with 10-year history of left cheek lesion that has become more prominent with puberty and thickened over time. An excision found sebaceous nevus of Jadassohn. Fig. 1. Nevus sebaceous of the left cheek. Fig. 2. 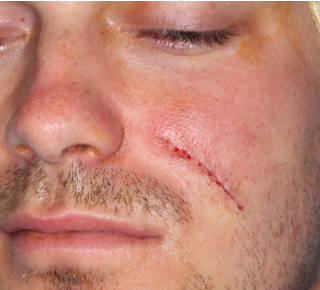 Immediately after excision of the cheek lesion. These congenital skin lesions are often excised. Timing and rationale of excision are based on the science behind the nevus sebaceous. Fig. 3. Histomicrographs of nevus sebaceous.